“…You know what they say about those Preacher’s Kids?…” How many times have I heard that over and over again? The problem is many people take what they hear without taking a moment to understand where they are coming from. As a preacher’s kid, or widely known as “PK,” author Tiara A. Mikell has witnessed first-hand the strains and pressures the family of the pastor goes through. On a spiritual level, it is quite evident that the enemy will seek to destroy a family of God…and in some cases, he unfortunately succeeds. 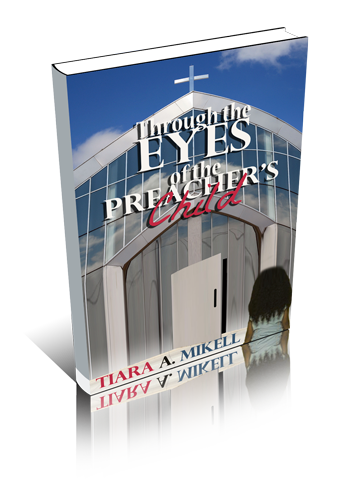 Through the Eyes of a Preacher’s Child’s depicts the journey of a preacher’s child – misunderstood. For the “PK” reading this, hopefully this will help you to learn and recognize that it is all for the better…later on, you will get it! You may never understand why the Lord called your father/mother/loved one to the ministry, but trust, it was no accident…God knew exactly what He was doing when He formed your family. With this in mind, you will have a closer relationship with God. While fictional in nature, Through the Eyes of a Preacher’s Child follows the lives of several individuals, as they look back over their childhood, growing up as a “PK.” Through the Eyes of the Preacher’s Child, will move you from criticizing “PK’s” and first families, to praying for them more intentionally.